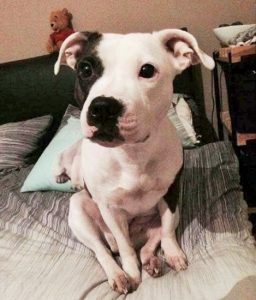 Poppy is a very soppy 7 year old Staffy girl in foster care through East Anglia Dog Rescue in Essex. She loves people but needs to be the only pet in the house. Older children would be fine for her, as long as she has plenty of peace. Poppy is not a fan of other dogs. If they show no interest, she will walk past them whilst on the lead but if they bother her she’ll snap at them to tell them off. She doesn’t like loud noises so needs a quiet retirement home. 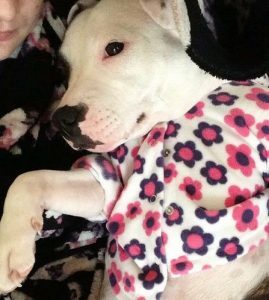 She’s crate trained and housetrained and can be left for a few hours. She’ll be overjoyed when you return though, as she really is a loving little lady! Or complete the Adoption Enquiry form on East Anglia Dog Rescue’s website. Please say you saw Poppy on the Oldies Club website.